"I was struck by the beauty of this part of Africa and the need to rid this country of the curse of malaria"
I write as I return to my post as a doctor treating young children with severe malaria at the Unité Paludisme after a week's break. After three months of work all volunteers working with MSF are entitled to a one week holiday that should be taken out of the country where they are working. I chose Addis Ababa, capital of Ethiopia, for my break as there is a direct flight that takes just under four hours. Although there’s a river close to our residence at Moissala we are forbidden to swim in it; I am sure with good reason. It was therefore a pleasure to swim in the early morning in the outdoor swimming pool of our hotel, so well heated that in the cool of the morning a fine mist like vapour arose, indicating the difference between the very warm water in the pool and relatively cool morning air. Whilst in Addis Ababa we visited the National Museum of Ethiopia that houses what remains of the skeleton of “Lucy” one of our ancestors of several million years ago, but it is interesting to note that our oldest known relative actually lived in Chad! The first stage of my return is by plane which takes me to Sarh a small airport in the south of Chad. The flight is organised by the United Nations Humanitarian Air Services for the many humanitarian organisations who work in this part of Africa. We travel in a Dash 8- 100 a twin engine propeller aircraft with a capacity of just over thirty passengers. Alex, with whom I am travelling back to Moissala with, and I are both wearing our MSF T-shirts and we carry with us our MSF passes that must be shown at all times. Since I arrived in Chad in May, the capital N’Djamena has suffered from two serious bomb attacks with many killed and wounded. Understandably therefore security has been increased, but as we drive in a clearly marked MSF vehicle wearing our MSF T-Shirts we pass rapidly through military road blocks, an indication of the confidence and trust between MSF and the Chadian authorities. After Sarh the journey is by road in the MSF 4X4 Toyotas that seem to be the most widely used vehicles here. They are used by other humanitarian organisations and seem to cope well with a terrain that can be very taxing. When I first started to read about Chad before starting this assignment I found a book that had been written about twenty years ago and stated that there were only 36 miles of tarmacked road in the country, now that figure has risen to many hundreds of miles. The first part of the route from Sarh is on a good tarmacked road, but afterwards the road is compressed earth that is the distinctive red brown of the soil of the region. During the dry season which was just coming to its end when I first arrived in May the road had been well compressed, but once the rains arrived at the beginning of June the muddy parts were gouged out leaving very deep ruts that demand a lot of concentration on the part of our drivers. Perhaps even worse, once certain sectors of the road dry out one is left with a fine sand in which the vehicle tends to wallow or is directed along tracks left by whatever car or lorry has preceded it. In and around the town of Moissala there are no made up roads and hardly any motorised vehicles other than those of the humanitarian organisations. The main form of transport is the ox-drawn cart that seems better adapted to the terrain than anything more modern. 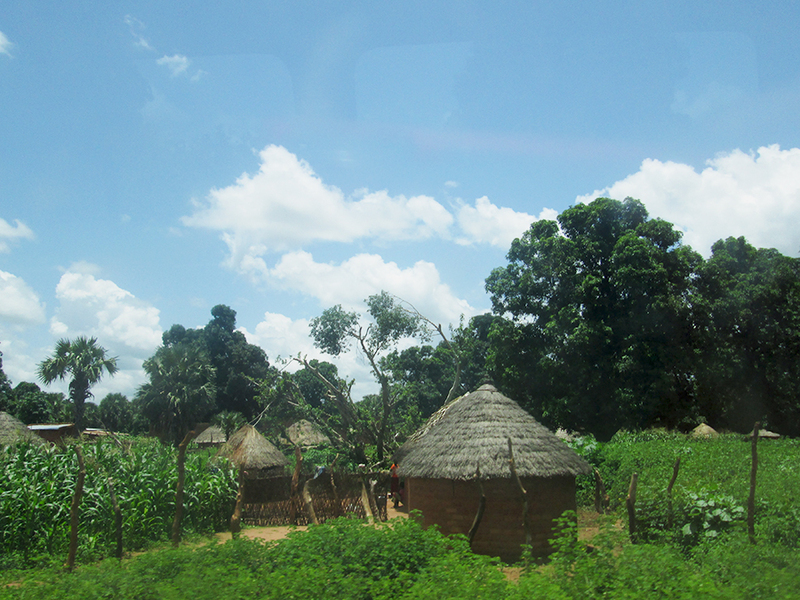 When I travelled from Sarh to Moissala in mid-May I was struck by the dry parched land though which I was passing but when I made the return journey, three months of rain had transformed the landscape into a lush green verdure. Driving though the villages with their round thatched houses surrounded by a profusion of crops: maize, cotton, potatoes, and many other plants that I could not identify, all in full growth together with trees in full leaf and of a dark green that one rarely sees in Europe, I was struck by the beauty of this part of Africa and the need to rid this country and its neighbours of the curse of malaria that so easily kills its children and slows its economic development. Médecins Sans Frontières with its program of prevention, as well as treatment, is making a huge contribution in the fight against malaria. I am proud to be part of an organisation that I believe, in not too many years’ time will have helped to conquer a disease whose elimination is already long overdue.